Yay! I can now provide a link for non-Ravelry members to see my items on Ravelry. 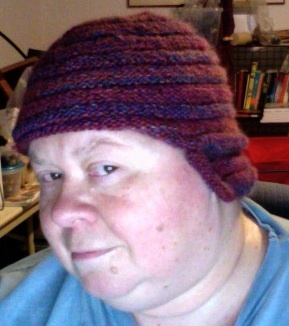 Still learning that my gauge is loose; I made almost the whole hat with the recommended size 3 needles. It took 4 skeins and was the size of a prize-winning pumpkin at the Half Moon Bay Pumpkin Festival. So I remade it on smaller needles and cast on fewer stitches than recommended. It fits snugly and covers the ears. The Grignasco Top Print is very soft and was amenable to being frogged. This entry was originally posted at http://firecat.dreamwidth.org/677191.html, where there are comments. Do you swatch? That's really the only reliable way to know what your gauge will be with a given yarn. I don't swatch for small projects like socks and hats. I'm coming to the conclusion that I usually get gauge with 2 needle sizes smaller than the pattern calls for, so in the future that's what I'll start with, instead of starting with the recommended size.